are now available for purchase! The Shain and Tara Saberon family have been growing produce on our 7-acre farm in Smoot, Wyoming since 2001. We are a small family farm operation that performs our own day-to-day labors with the help of a small crew of dedicated Workshare helpers and volunteers. We are passionate about growing produce that tastes great, is clean and healthy, and of the highest quality. The cost of a membership is $600. There is also a one-time $50 delivery fee for shares being delivered each week to Jackson. A minimum payment of $200 will reserve your membership, with the balance due by April 1, 2017. 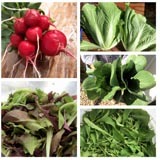 We plan to start harvesting produce by mid May and continue weekly deliveries through mid October. 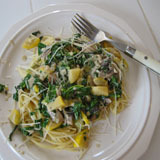 Our CSA seasons typically last 22 weeks. For more detailed information about EverGreen Farm and our upcoming CSA season, please download our 2017 CSA Sign-Up Form or contact us directly. Download and read our 2017 CSA Sign Up Form (above). Complete the contact information page. Mail in your paperwork with a full or partial payment. Sign up for our Workshare Program! We are seeking individuals who are interested in helping on our farm 4 to 5 hours each week in lieu of paying for a CSA membership. This is for folks who enjoy gardening and will literally work for your food (plus many other perks). For more information, please download our 2017 Workshare Contract or give us a call. Download and read our 2017 Workshare Contract (above). Also download and read the 2017 CSA Sign Up Form (above). Complete the application page of the Workshare Contract and return by mail. We are happy to answer any other questions. Please feel free to contact Tara at 307 884 6423 or tarasaberon @ gmail . com.